It can undoubtedly be difficult for the business firms with multiple locations to craft rich, unique and relevant content for every individual location page but some experts will definitely have some kind of advice on that. Brands which have more than one locations often have a tough time in producing unique content for each and every location where they’re located and hence they mostly use a template theme which gets the content filtered. What are the steps that such multi-location businesses can take to enhance their location pages and avoid such a filter? Here are some tips to take into account. 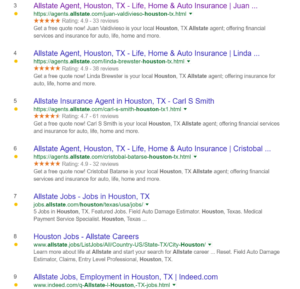 Utilize testimonials: There are a number of insurance companies which have 148 offices throughout the country and you will be rather surprised to know that each one of those offices have a unique location page which is competing with the same set of keywords like ‘auto insurance Houston’, ‘brand name + Houston’. This is where Google’s filter will play a role and most of their pages will be filtered for being so similar to each other. Hence, one way you can combat this is by using a service called Get 5 Stars which automates the process of collecting customer reviews and publishing them. The agent can also post responses which are also published. Include driving directions in the content: One more way for big brands to make unique location pages is to include driving directions to the office. Majority of the companies will only include Google Maps but when you write driving directions, this gives enough uniqueness to the content as it becomes much more useful to the customers. You can also get more local signals on the website due to being specific about the location. Create bios for employees: Another easy way of getting rich content is by making it different for various locations. You can add detailed employee bios as this offers you a natural process of including keywords on the site and in the geographical areas. When you speak about his services, you can automatically include keywords. Add customized photos: Majority of the big brands don’t add photos to their location pages and instead stick to a generic photo. Photos allow you to add descriptive keywords in the file of the image and alt-text. Therefore, if you wish to create unique business pages for your local business, take into account the above mentioned tips and strategies.